DARTMOUTH – Paced by a career-high five points from junior Mary Brown, the University of Massachusetts Dartmouth erupted with four second-half goals to defeat Framingham State by a 5-0 decision at Cressy Field in Little East Conference action in Dartmouth yesterday, October 10. With the win the Corsairs improve to 6-6 and 4-4 in Conference play. The Rams are now 2-11 and 1-8 in conference. UMass Dartmouth opened the match with a strong attack, creating a pair of corner chances in the opening five minutes. In the seventh minute, the host took the advantage when Haley Donahay passed to Erin Kish on a corner entry before taking the direct pass back and picking up her third goal of the year. The shot total in the opening period swayed in the direction of Framingham State, but Corsairs’ keeper Allison Burke was up to the challenge. With 18:12 to go, Burke turned away the first solid chance in front of the net from the Rams. In the closing seconds of the half, she did it again, kicking away the first shot before sprawling the crease to deny the rebound attempt to keep the lead intact. Following the intermission, the Corsairs began their second half scoring barrage when senior Delaney Burns created an opportunity after her shot was deflected by the Rams keeper. Brown positioned perfectly near the right post, scooped up the ball and ripped it to the back of the cage. In the 53rd minute, Brown recorded her second marker in the game after moving the ball into the circle, losing a defender, and finishing her fifth goal of the year. Moments later, Burns got herself on the goal sheet, redirecting a shot from Brown to up the margin to 4-0. With less than two minutes remaining, the Corsairs converted another for good measure as freshman Alexis Keohane realigned a shot off the stick of classmate Desarai Melendez, closing the book on the 5-0 final. The Corsairs held a 26-17 advantage in the shot column. Burke logged 57:43 minutes of regulation, picking up her sixth victory of the season and turning away 11 shots. Freshman Katelyn Banalewicz saw her first action in net, earning her first career save. The hosts had the upper hand in corner chances from the start, amassing nine in the first half and two in the second to Framingham’s five throughout the game. 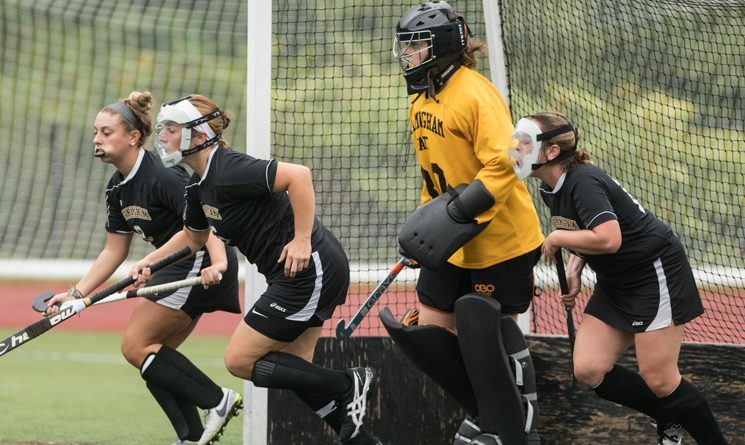 Framingham State takes on Wheelock College Thursday at 4 p.m.